The PEM fuel cell uses a polymer membrane as its electrolyte. The cell was invented by US company General Electric and tested for US military use in the early 1960s. After development for the US Navy it was adopted by the British Navy in the early 1980s. Since then it has attracted most attention as a possible replacement for the internal combustion engine for automotive applications. 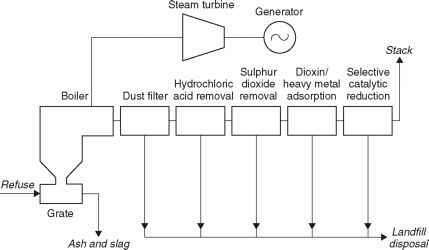 However a number of companies are also developing stationary power applications. The membrane which forms the electrolyte of the PEM cell is usually a compound called poly-perfluorocarbon sulphonate. This is a close relative of teflon but with acidic sulphonate molecular groups attached to its backbone to provide conductivity. In its normal state the membrane is not conductive but if it is allowed to become saturated with water it will conduct hydrogen ions. The membrane itself is usually between 50 microns and 175 microns thick, the latter equivalent to seven sheets of paper. Electrodes of porous carbon containing platinum can be printed onto the membrane. A further porous carbon backing layer provides structural strength to each cell as well as supplying electrical connections. As with the PAFC, cells are joined in series and in parallel to provide sufficient current and voltage. 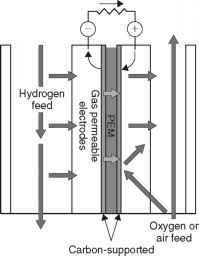 platinum catalyst Figure 7.2 Diagram of a PEM fuel cell hydrogen and oxygen (from air) to operate. As a consequence of the very low operating temperature, the hydrogen fuel must be virtually free of carbon monoxide to prevent catalyst poisoning. The PEM operating on hydrogen has a fuel to electricity conversion efficiency of 60%, significantly higher than the PAFC cell. This, combined with the light structure makes the device attractive for automotive applications. In practice, however, the fuel is normally derived from natural gas. The low cell temperature means there is no waste heat suitable for driving the methane-reforming reaction so some fuel must be burned to provide additional heat. This reduces the overall efficiency of the cell to around 42%, similar to that of the PAFC fuel cell. The development of PEM fuel cells has advanced rapidly as a result of investment from the automotive industry. A Canadian company, Ballard Power Systems, has built a 250-kW stationary fuel cell based on PEM technology but this prototype may never be developed commercially. Several other companies, including General Electric, and Nuvera Fuel Cells are planning units for power generation. A number of much smaller PEM units are also being developed for domestic and light commercial power applications. The first practical applications may be as a portable power source for laptop computers. Operating a PEM fuel cell on reformed natural gas limits its performance, not only by reducing overall efficiency but also by hindering response time. While a PEM fuel cell fuelled with hydrogen can be brought on line rapidly, the reforming system is likely to require 20min to reach operating temperature. However the technology appears to be inherently cheap. 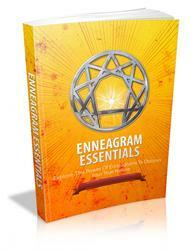 This will be the key to its success in the near term.